Ed Gorman's blog: Shadow Games and Other Sinister Stories of Show Business available for pre-order! 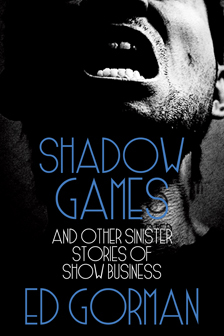 Shadow Games and Other Sinister Stories of Show Business available for pre-order! Ed here: My first cousin Bobby Driscoll was a major child star of the late 1940s and early 1950s. He died at thirty of drugs. While I don't use any of Bobby's life in this novel I do look at child stardom here. Theses a slightly revised edition of Shadow Games (1992) which I wrote at the time I was writing scripts for two different directors and learning a little about the ways of Hwood. "What keeps you reading is not the traditional question of whodunit but the slick and artful ease with which Gorman portrays the alienated, uncaring world of his creation." This brand new edition is available for pre-order from the Short, Scary Tales website. The first 100 copies sold direct from the site will be signed by me and the cover artist, JT Lindroos!